Thenceforward, with the 1,250 Arahants being sent forth on their mission of disseminating the Buddha's Message, the news flashed in all directions, and soon reached the city of Kapilavatthu, the Buddha's hometown, that the Sakyan recluse had been enlightened, becoming thereby the Buddha, and was preaching His Message in the state of Magadha with great success. Of course, king Suddhodana was delighted to know this. He managed to send his envoys, one group after another, inviting the Buddha to come back to His hometown. For nine times had the king tried to do so and for all those times never was there any of the envoys returning, since they all were ordained. It was then in the second year after the Buddha's Enlightenment that the king sent once again a senior courtier by the name of K lud y as his representative and for the same purpose. As before, K lud y and his men were all ordained and attained Arahatship. But being resourceful the courtier managed to find a way by which he was able to persuade the Buddha to response to the king's invitation. It was during the summer period of the new year that the Buddha, together with a number of His Bhikkhu followers, includes K lud y , set out from the City of R jagaha. He walked covering the distance of one Yojana (i.e. 16 kilometres) a day. Thus it took Him two months to reach Kapilavatthu, where He and other Bhikkhus were invited to stay in the Nigrodh r ma, near Mah vana Grove, which was offered Him by His relatives. On the day of His arrival He delivered to them a sermon on the Mah vessantara J taka story, by which they were all delightedly imrpressed. 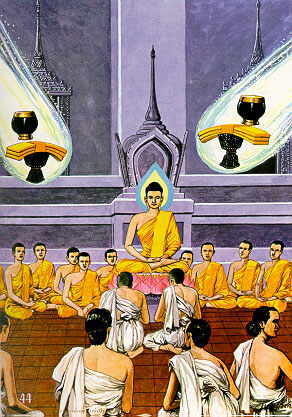 On the following day He preached to His royal father until the king achieved the Eye of Dhamma. He and the other Bhikkhus stayed within that Grove throughout the rainy period of that year. One day while the Buddha and the Bhikkhus were invited to a meal in the king's palace, His former consort Bimb Yasodhar suggested to Rahula her son, then aged seven, that he should ask permission from the Buddha to be heir to His throne. But the Buddha, ignoring His son's request, took the boy with Him to the Nigrodh r ma and had Venerable S r putta ordained him as a S manera (novice). This by means of having the boy recite the passages declaring his intention to take the Triple Gem as his Refuge, The novice, having been steadily instructed by the Buddha, soon achieved Arahatship. He was the first novice to be able to do so. Now Bimb , having learnt that her beloved son had followed the Buddha and been ordained a S manera, was afflicted with such a poignant sorrow and grief that she soon fell ill. Her illness appearing to be terminal, the Buddha paid her a visit and preached to her until she attained Arahatship, However, due to her age coming to its end, she passed away on that same day, being thereby the first woman who won through to Arahatship and who passed away before all other Arahant disciples of the Buddha.